Most of the information that follows is taken from Lloyd K. Hoffman’s research which he compiled in a document entitled The Hoffman Family: Two Hundred Years in America, housed at Shepherd University in Shepherdstown, WV. According to this document, the Hoffmans and Newcomers arrived in Germantown (Philadelphia) around the same time, in the 1720s and ‘30s, and intermarried. When I first started researching the Hoffmans (my mother’s father’s family) I began encountering the name Newcomer—initially as a middle name. My mother had an uncle christened Worthington Newcomer Hoffman. I developed an instant fondness for this delicious mouthful of a name. (In Colusa County he was just “Uncle Worth.”) As a newbie genealogist I was puzzled by the possible origin of this name, Newcomer. Focused as I was on the migration of my family into California, I wondered, did the name Newcomer somehow relate to their recent arrival in California? Turns out my instincts were correct about the name being connected to being new arrivals. I was just a continent and a few centuries off in the particulars. According to Lloyd Hoffman, our Newcomer ancestors spent many years fleeing religious persecution and wars in Europe prior to emigrating to America. They apparently were part of the Waldensians, a pre-reformation religious movement originating in Lyons, France early in the 14th century and led by Peter Waldo (or Waldes or Valdes). The Roman Catholics were eager to wipe out this hotbed of controversy with various persecutions and wars that went on for centuries. Many Waldensians left Southern France for the northern valleys of France and Germany, and by the 1500s many were hiding in the Cottian Alps, which border on Switzerland. Apparently my early ancestors left France and their French name (probably for security reasons), adopting Nei Comers, or New Comers, when they landed in Switzerland. Peter Newcomer was the first of my branch of Newcomers to emigrate, coming from Switzerland in 1720, and landing in Germantown (Philadelphia). My Hoffman ancestors were, as I suspected, immigrants from Germany. As to the Hoffman name, a hoff refers to a settlement, farm or house, so Hoffman refers to a man who either owned his own house or farm or was a steward of a settlement or farm. Peter Von Hoffman is named as an early ancestor whose family was originally from the Old Grand Duchy of Baden, a German state and a historical territory of the Holy Roman Empire. Prior to emigrating to America this branch of the family had moved further down the Rhine Valley to a part of Germany very near the Holland border, where the Reformed faith was embraced. Many inhabitants of the Upper Rhenish states left their homes and farms after the Protestant Reformation and the 30 years of war that followed (the 30 Years War ended in 1648), and my ancestors appear to have been among them. Prior to emigrating to the American colonies, the Newcomers and Hoffmans had been slowly moving and relocating through parts of Europe, crossing mountains and crossing borders. For generations and through centuries, they sought to escape the ever-exploding violence of the religious conflicts that made peaceful living impossible. The 16 week sail from Rotterdam to Germantown, Pennsylvania was only one of the more recent in a long list of moves made by the Hoffman and Newcomer clans. Apparently, the German families tended to send a family member off to a potential new region to check on conditions, and if they were favorable many more family members followed. Adam Hoffman, from whom I am descended, was the first of three brothers to emigrate to America. He sailed from Rotterdam, Holland on the ship Winter Galley in 1737. When he arrived in Germantown in the early days of 1738, he was 23-years-old. It was a full decade (1747) before the second brother, Michael arrived, also in Germantown. A third brother, Robert, followed two years later in 1749. Adam and Michael settled in Pennsylvania and raised large families. It was Robert who led a group of his nieces and nephews from Pennsylvania to Maryland and Virginia where many of them settled, including one of Adam’s sons, John Hoffman. (This is in conflict with my understanding that John Hoffman was born in Virginia—I now believe he was born in Pennsylvania but moved with other family members to the Shepherdstown, WV area.) 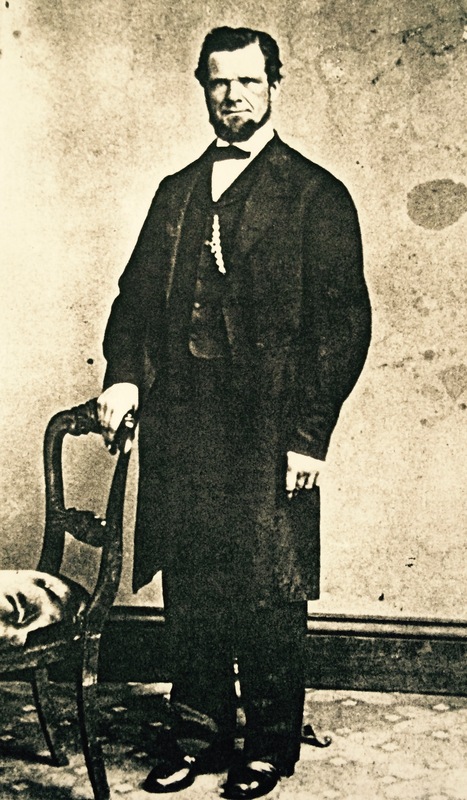 John Hoffman married Sallie Newcomer, the great-granddaughter of the above-mentioned Peter Newcomer. John and Sallie are my 4th great-grandparents. The Newcomer name was handed down to my 2nd great-grandfather (the one who came west to California, landing in Sutter County) Samuel Newcomer Hoffman, and on to one of his three sons, the afore-mentioned Worthington Newcomer Hoffman. “Gramps” was written at the top of this photo by my grandfather, John Wade Hoffman. I believe it is his grandfather, Samuel Newcomer Hoffman. I spent some time researching the Waldensians and pre-reformation history. It is complicated and there is much conflicting information, not surprising when religious claims are involved. But what I do know is both the Hoffman and Newcomer branches of my family were part of the reformation movement centuries before what we know as “the Reformation,” as initiated by Martin Luther (his 95 Theses was published in 1517). The early branches of these families in America were Mennonites and Dunkards. In Shepherdstown, WV, they were members of the Reformed Church. They came to America to be able to escape religious persecution, and in this they were successful. They did not find freedom from war, however. For the next 150 years they and their descendants endured the French and Indian War (1754-1763), the Revolutionary War (1775-1783), the War of 1812 (1812-1815), and, most devastatingly, the Civil War (1861-1865). My grandmother, Marjorie Cain, attended Chico State Teachers College in the 1920s, graduating in 1925. I’ve been researching various details of her life for a historical fiction novel I am writing which borrows liberally from her life and times. Last November I spent some time at the California State University, Chico (CSUC) library delving into what campus life was like in the 1920s. 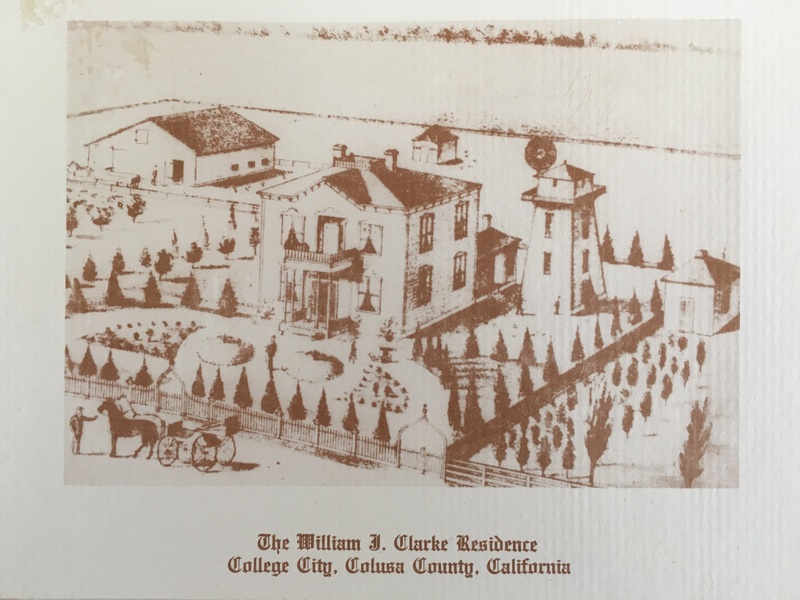 That’s when I discovered that Chico State Teachers College, as it was known during my grandmother’s era (formerly Chico Normal School—the name changed in 1921), had a summer camp where students could attend a 6-week session. The camp was located in the town of Sisson. The only problem was, where the heck was Sisson? Did it still exist? The idea of Chico Normal School holding a summer session was first raised in 1916, but WWI caused a delay to the plan. 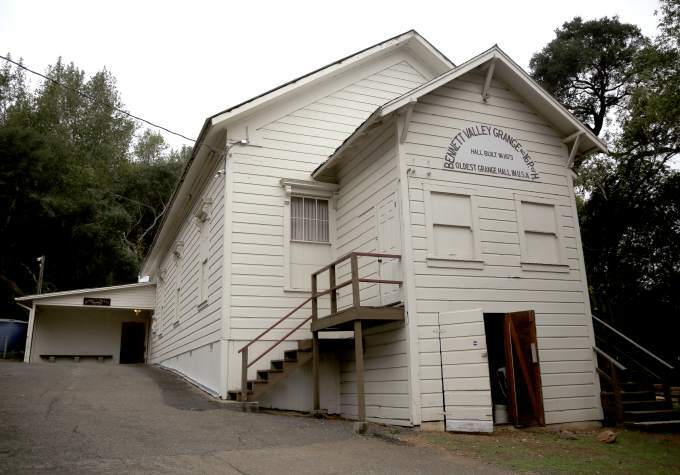 In 1918 a location for the summer camp was sought somewhere in the Sacramento River canyon, and the town of Sisson was chosen. At that time it was common for people to escape the heat of the valley by summering at higher elevations. Locating the camp at Sisson benefited both the town and the college. The first summer session was held in 1920. Mt. 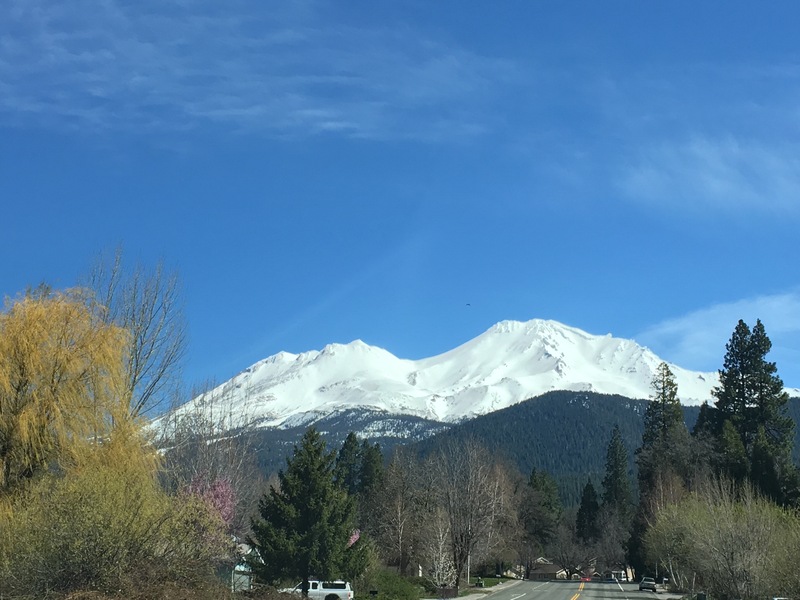 Shasta as seen from the town of Mount Shasta. It turns out that Sisson is the former name for the town of Mount Shasta. 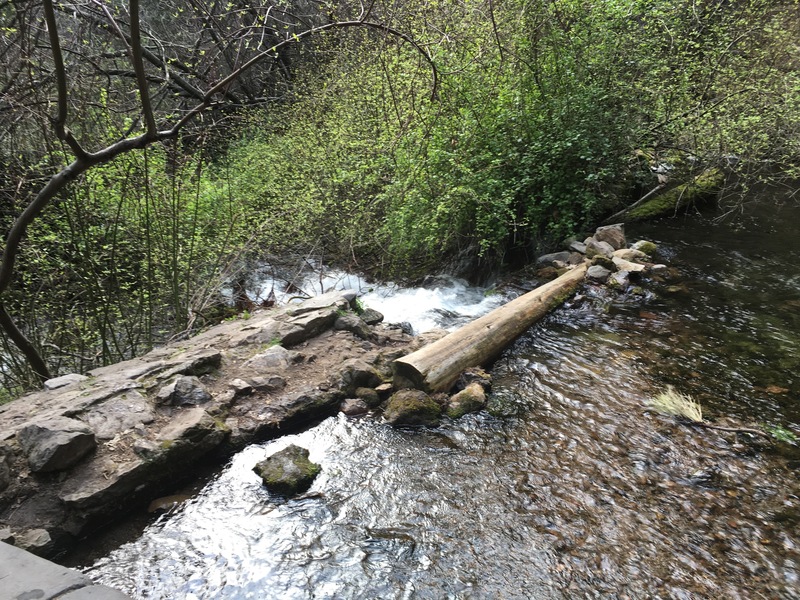 When Molly and I recently learned that the headwaters of the Sacramento River (ok, one of the headwaters) is also located in Mount Shasta, we decided we must plan a stopover on our annual road trip to the Pacific Northwest. 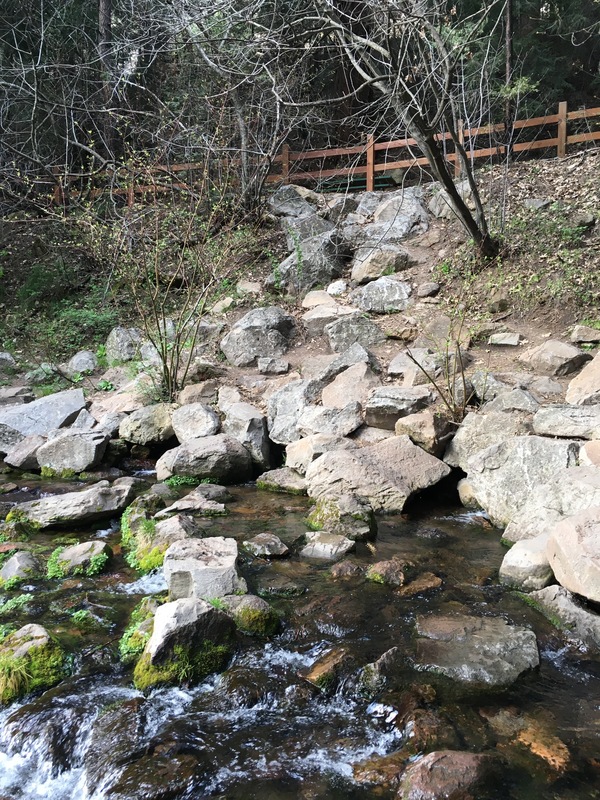 Excited about this confluence of our shared obsessions with California and family history, and the headwaters of California rivers, we continued our research on the exact locations of the camp and the source of the Sacramento River. 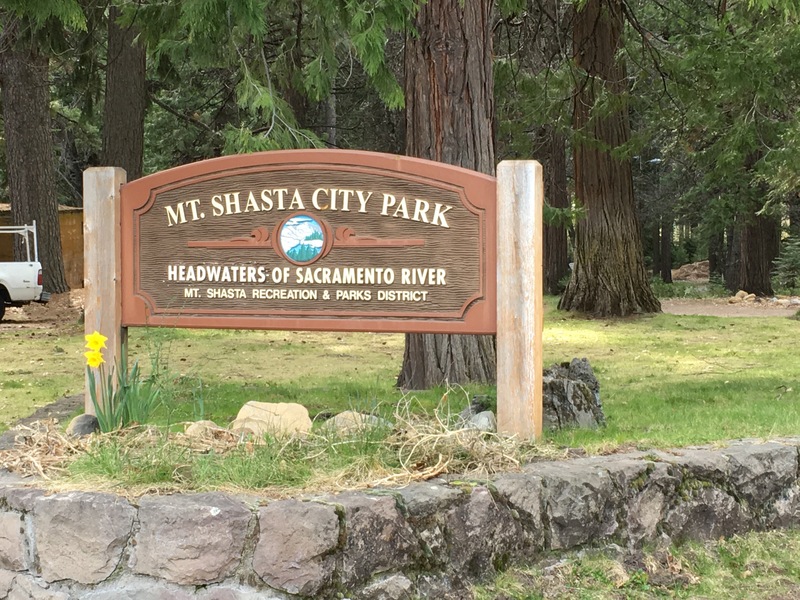 The searches led us to one and the same place: Mount Shasta City Park. The summer camp (which is now the city park) was situated near the railroad and Big Springs, from which the Sacramento River flows. Drought or no drought, the cold, crystal clear water continues to pour right out of the foot of Mt. Shasta. During our visit to the park we saw people drive in with jars and jugs to capture the water, which is pure enough to drink right out of the springs. Construction of the camp continued for a number of years. Most of the buildings used by the summer camp were in place by 1927. These included bathrooms, a power house, a dormitory which housed 40 students, a manual training building, a laundry, a kitchen and dining room, an art building, more dormitories, a lodge, an administration building, a hospital, and a home for the Dean of Women. I had been wondering if any infrastructure remained from the camp, which ran from 1920 until 1942. The Mount Shasta Recreation and Parks District website, which describes the current-day 26 acre city park, states that “the park facilities include picnic areas, playgrounds, and five public buildings.” What they neglect to mention is that the buildings were constructed for the CSTC summer camp in the 1920s. It seemed to me that the history of the summer camp was under-appreciated, as there was nothing about it at the Mount Shasta Museum—although one of the volunteers did find a 3-page article in a binder that had some of the history—and there was no signage or information in the park that mentioned the history of the buildings. Too bad. Such a beautiful setting in which to study! One of several hiking trails in the park. The summer student can not do better than to attend the Mount Shasta Summer Session. The camp is located conveniently, near the village of Sisson, in a beautiful grove of cedars, pines, firs and oaks. The famous spring of “Muirs Woods” gushes ice cold water from beneath the lava rock, furnishing the water supply of the camp. The natural scenery surrounding the grounds can not be surpassed. To the north and east, but a few yards from the camp, one hits the trail that ascends 14,380 feet to the crest of the sublime Mount Shasta. To the west rises Mount Eddy. These two mountains are snowcapped the year around. Among other points of interest which are easily accessible by pack animal or by auto are Castle Lake, McCloud River, Castle Crags, and Crater Lake (Oregon). Week-end trips are made by students to these points, chaperoned by members of faculty. Social life in the camp is quite ideal. The housing is provided for by means of dormitories and tents. A cafeteria on the grounds provides plenty of appetizing and wholesome food at moderate prices. The Lodge furnishes a place for amusements, such as dances, musicals, plays, and all general recreational parties. There are half-day sessions conducted during the forenoons, leaving afternoons free for study and recreation. A summer spent at the Mount Shasta Summer Session cannot but prove one of delight and profit. By all accounts that we’ve read or been told, the students had an absolute blast at these camps. I only regret I was born too late to attend, and it’s one more thing I wish I had talked to my grandmother about when I had the opportunity. 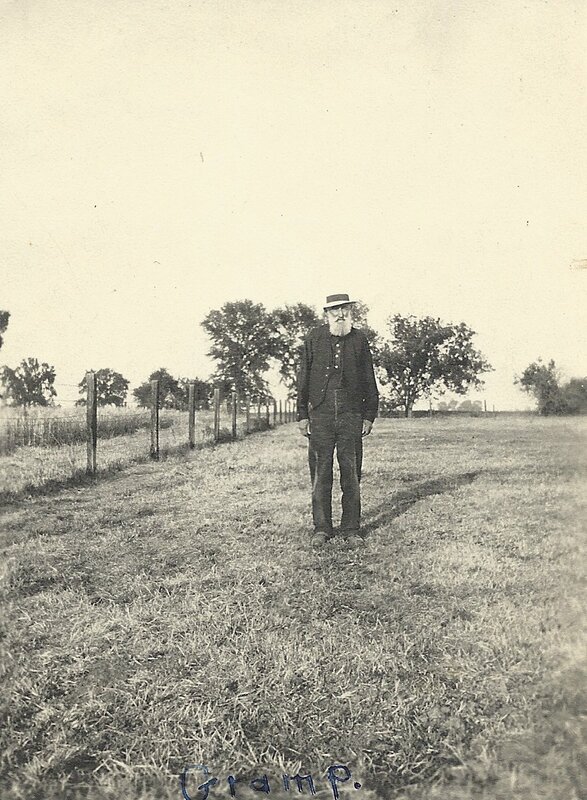 In my last entry I speculated whether events other than the deaths of two of his adult children drove my great- great-grandfather, William John Clarke, to take his own life in October of 1894. A comment from my brother-in-law about the financial panic of 1893 jogged my memory and sent me scurrying back to review Rulers & Rebels, A People’s History of Early California, 1769-1901 by Laurence Shoup. I recently read this book with particular interest in how historical events may have affected my ancestors who farmed north of Sacramento. After more careful review, and getting my dates straight—bingo! Not only was there a panic in 1893—the biggest depression the country had ever faced up until that time—but a railroad strike occurred in the summer of 1894 which had dire effects on the farmers in California who were unable to get their crops to market, or even acquire sacks to harvest the wheat in. The 1870 census states that William John Clarke’s real estate was worth $124,440 and his personal estate was worth $20,000, so he was quite well off. Although there was also a financial panic and a railroad strike in the mid 1870s, he seems to have weathered those crises. But by the fall of 1894, when he took his life, he may have been wiped out by one-two punch of the depression in 1893 followed by not being able to get his wheat and other crops to market during the summer of 1894. As supporting evidence I offer a line from a letter written by Clarke’s stepdaughter (my great grandmother), Lizzie (Tenney) Clarke Cain, after her stepfather’s death. She states that William John Clarke was once well-to-do but the land was mortgaged and “it all went for bad debt”. I have also been able to read the probate proceedings that occurred after Clarke’s death on the Ancestry.com website. Clarke’s widow, Catherine (Foster) Tenney Clarke, was left only with their home and some personal belongings. It is true that everything else was sold off or repossessed. The Pullman Strike of 1894 affected the entire country, but was particularly brutal in California. The strike began when the American Railroad Union called for a nation-wide strike against the Pullman Company in Chicago, where workers were being subjected to horrible conditions. It was not a strike against all railroads, only the Pullman Company. All trains were to be allowed passage with the exception of those carrying Pullman cars. Southern Pacific in California reacted by unnecessarily placing Pullman cars on every train, including mail trains, whether they needed them or not. However, as the strike went on and became more violent, and neither side would compromise, public support began to wane. It is an anomaly in civilized society in having some of the characteristics of organized warfare in presence of the reign of law and peace. That is the condition that confronts the people of California today. The opposing forces are the Southern Pacific Company on one side and its employes [sic], swayed and influenced by a powerful labor union, on the other. In such a conflict it is to be presumed that both sides are prepared to make some sacrifices that will involve losses to both of a very serious character. Both seem to fear that if any concessions are made looking to a settlement, precedents will be established that will in the future operate to the disadvantage of whichever party makes the concession. The corporation contends that the success of the strikers will mean that henceforth the most trifling differences between labor and capital will be arbitrarily settled by the interference of labor organizations, and that every employer in the country will be made a party to any trouble that may exist between every other employer and his help. On the other hand the labor organizations insist that this is a boycott against Pullman and not a strike against the Southern Pacific, as they have no grievance against that company, and that if Pullman triumps[sic] they will be crushed and labor may as well surrender unconditionally to aggregated capital and organized monopoly, all the rights for which it is now contending. Between these two contending forces, and in no way responsible for the actions of either, stands the public, the inoffending people, whose losses are infinitely more than the combined losses of both parties to the irrepressible conflict. Business is at a standstill; freight and passenger traffic are blocked; grain cannot be harvested, because the farmer can get no sacks; thousands of tons of fruit are rotting, because transportation is denied; and all this is occurring at a time when the people are least able to withstand the effects of such a disaster. They have not recovered from the effects of the recent panic, and it would be impossible to imagine a greater misfortune to California interests than that these labor troubles should have occurred at this time. The information I’ve read about William John Clarke’s suicide stated that he was despondent over the deaths of two of his adult children. It’s true he shot himself on the grave of his son Willie. You can’t say he didn’t have a flair for the dramatic. But Willie had been dead for four years. And Celia, his youngest daughter, had died almost a year previously. I can’t say that sadness around the deaths of his children didn’t play into his decision to end his life. But it just didn’t add up for me. In investigating the historical events of the time I found what I submit is a more believable reason for his suicide. The Pullman Strike of 1984 was indeed a disaster for my great-great-grandfather. I believe he was crushed between two contending forces.